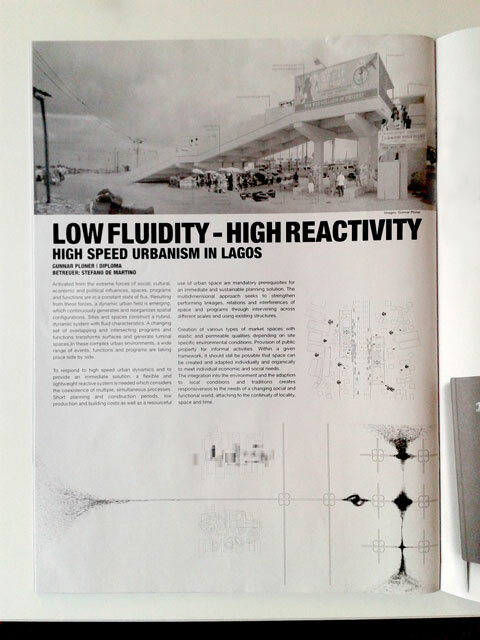 High Speed Urbanism in Lagos is publicated in the Potenziale 2 magazine of the Institute of Design Studio1 – Stefano de Martino. The aim of the project „LAGOS“ is to develop a sense for responsive urban planning methods which are initiating, gradually mediating and equalizing disparate forces in complex urban fields. Introducing a loop strategy for urban planning instead of static top-down urban planning methods, the project proposes possibilities for various bottom-up interventions across different scales. The focus lies on the production of control- and guidable bottom up urban conditions. Activated from the extreme forces of social, cultural, economic and political influences, spaces, programs and functions are in a constant state of flux. Resulting from these forces, a dynamic urban field is emerging, which continuously generates and reorganizes spatial configurations. Sites and spaces construct a hybrid, dynamic system with fluid characteristics. A changing set of overlapping and intersecting programs and functions transforms surfaces and generate luminal spaces. To respond to high speed urban dynamics and to provide an immediate solution, a flexible and lightweight reactive system is needed which considers the coexistence of multiple, simultaneous processes. Short planning and construction periods, low production and building costs as well as a resourceful use of urban space are mandatory prerequisites for an immediate and sustainable planning solution. The multidimensional approach seeks to strengthen performing linkages, relations and interferences of space and programs through intervening across different scales and using existing structures. The creation of various types of market spaces with elastic and permeable qualities depending on site specific environmental conditions and the provison of public property for informal activities are essential components. Within a given framework, it should still be possible that space can be created and adapted individually and organically to meet individual economic and social needs. The integration into the environment and the adaption to local conditions and traditions creates responsiveness to the needs of a changing social and functional world, attaching to the continuity of locality, space and time.